This paper is a revised and expanded version of the paper entitled ‘The relationship between corporate governance and the performance of the firm: a literature review with a focus on the Vietnamese enterprises’ presented at the Proceedings of the 4th International Conference on Management, Leadership and Governance(ICMLG), Saint-Petersburg State University of Economics, Russia, 14-15 April 2016. This study examines the effect of corporate governance on firm performance measure as ROA and Tobin’s Q of listed companies in Vietnam. Data samples were collected from 189 companies for Fiscal years 2011 – 2014. Fixed-effects and Random-effects models were estimated to evaluate the impact of corporate governance on firm performance. The study found evidence that some characteristics of corporate governance such as CEO duality, board size and women on board have a negative influence on firm performance as measured by ROA and Tobin’s Q. By contrast, independent audit committee members, ownership of governance, ownership of foreign institutional investors and ownership of domestic institutional investors have a positive impact on these two performance measures of firms. The study also revealed a positive impact of ownership of managers on firm performance measured by ROA, however, in the case of Tobin’s Q there is no significant correlation. corporations are monitored, controlled, and directed. Corporate scandals in many different countries have maintained both public and political interest in corporate governance, especially in countries with a weak legal framework (Klapper and Love, 2004). However, previous studies often show conflicting results regarding the impact of corporate governance on firm performance (e.g. Cheng, 2008; Christensen et al., 2010; Pham et al., 2011). In Vietnam, the concerns and discussions on the relationship between corporate governance and firm performance has been a new issue. There were several research studies examine the effect of corporate governance on firm performances; however, these research results are quite dissimilar (e.g. Dao and Hoang, 2014; Vo and Nguyen, 2014). In this paper, the author continues with an earlier study conducted Pham in 2016, titled “The relationship between corporate governance and the performance of the firm: a literature review with a focus on the Vietnamese enterprises”. The author consider some elements of corporate governance, namely, the duality of CEO, the size of the board, the presence of female board members, the presence of independent audit committee members and the ownership of institutional investor. The result of the current study will contribute to the existing knowledge relating to corporate governance practices on firm performance of Vietnamese publicly traded companies. It will also provide management with useful knowledge on corporate governance mechanisms which affect the firm performance in Vietnam. This paper is comprised of the following sections: Section 1 provides an introduction. Section 2 reviews the prior empirical literature on corporate governance and firm performance. The research hypotheses are developed in section 3. The data and methodology are described in section 4. The next section discusses empirical results. Finally, the last section concludes the study with main findings. According to agency theory, CEO duality is bad for firm performance due to a compromise between the monitoring and control of the CEO since CEO duality may hinder the ability of board to monitor management and hence raise the agency cost (Jensen and Meckling 1976; Fama and Jensen 1983). Yermack (1996) suggests that a company is more valuable when CEO and chairman positions are held by different persons. Similarly, Fosberg (2004) found that firms with the separation of the CEO and Chairman position are likely to employ the optimal amount of debt in their capital. Contrary to agency theory, stewardship theory shows that CEO duality would improve company performance given that CEO duality can monitor the company unambiguously and can also have a unique command throughout the company (Adams et al, 2005; Davis et al, 1997). A firm with the two positions held by one person would avoid confusion among managers, employees, and other stakeholders and also facilitate more effective and quicker decision-making (Finkelstein and D’Aveni, 1994). Faleye (2007) indicates that CEO duality is positively associated with CEO reputation, managerial ownership, and organizational complexity. However, empirical studies examining the relationship between CEO duality and corporate performance has produced conflicting results. The study of Baliga et al. (1996) shows that there is no significant difference in firm performance when the duality status changes and there is also no significant difference in the effect of duality and non-duality on performance. By contrast, Elsayed (2007) concluded that the impact of CEO duality on firm performance vary across industries, moreover, CEO duality attracts a positive and significant coefficient in the cases where corporate performance is low. Dalton et al (1999, 2005) mention that one of the advantages of large board size is to enable the board to collect a wealth amount of information, which subsequently enhance firm performance. However, it is evident that small board size is more effective at monitoring top managers than large board size because a small board reduces coordination cost and free rider problems, and therefore it leads to high performance (Lipton and Lorsch, 1992; Jensen, 1993; Yermack, 1996). However, some researchers found that there is a negative relationship between board size and firm performance (e.g. Cheng, 2008) while some scholars concluded that the relationship between corporate governance and performance measures is insignificant (Pham et al., 2011) or conflicting (Christensen et al., 2010). Evidence suggests that board gender diversity may be associated with improved decision making, beneficial for governance, and ultimately, firm performance (e.g. Campbell and Mínguez-Vera, 2008; Jurkus et al., 2011; Smith et al., 2006). Smith et al. (2006) explain the importance of female representation on board as follows. Firstly, female board members have a better understanding of market place of the firm, and hence this increases creativity and innovation. Ssecondly, female board members may improve image of the firm and this will have a positive effects on firm performance. Moreover, empirical studies (Campbell and Mínguez-Vera, 2008; Jurkus et al., 2011) have found evidence that gender diversity enhances firm performance. However, several research studies have found a negative, or in some case insignificant, influence of female representation on board and firm performance (Larcker et al., 2007; Adams and Ferreira, 2009; Gregory-Smith et al., 2014). The audit committee plays a key role in supervising and monitoring management activities to protect the interest of shareholders. Independent directors with financial expertise are often seen as valuable resources in providing guidance and oversight of a firm’s financial reporting practices (Agrawal and Chadha, 2005). Aldamen et al. (2013) indicate that audit committee independence monitors management activities effectively because such committees are more likely to make objective decisions without negotiation and deliberation. Similarly, Erickson et al. (2005) conclude that independent members may minimize agency problems which therefore leads to the improvement of firm performance. A number of studies explored the impact of independent audit committee members on firm performance and these concluded that there is a positive connection between audit committee independence and firm performance (e.g. Aldamen et al., 2013; Ghabayen, 2012). Institutional shareholders and ownership structure play an important role in determining whether appointed managers expropriate minority shareholders (Lemmon and Lins, 2003). It is perceived that investors with large ownership have strong interest in maximising a firm’s value in pursuing their financial goals. Subsequently, the large shareholders have incentive and power to enforce managers to act in accordance with the value maximization goal of the company (Lemmon and Lins, 2003; Shleifer and Vishny, 1997). As Shleifer and Vishny (1997: 754) state: “Large shareholders thus address the agency problem in that they have both a general interest in profit maximization, and enough control over the assets of the firm to have their interest respected”. Similarly, Bethel et al (1998) point out that institutional shareholders bring out an increase in share value and the rate of top management turnover. With respect to the above literature review, it is suggested that there are mixed findings on some characteristics applied to corporate governance, as follows: CEO duality, board size, female board members, independent audit committee members, institutional investor ownership. H1: There is a positive relationship between CEO duality and firm performance. Over the last decade, the integration process expressed by Vietnamese companies has been accompanied by the increase of foreign investors and institutional investors who hold at least 5% of a firm’s outstanding shares. According to the survey carried out by the IFC, the GCGF and Vietnam’s SSC (2011), it is recommended that institutional investors should, wherever possible, incorporate demands of companies for good corporate governance implementation. Further, the OECD reports that institutional investors play an important role in promoting good corporate governance. H5a: There is a positive correlation between ownership of government and firm performance. H5b: There is a positive correlation between ownership of foreign institutional investors and firm performance. This study uses CEO duality status, board composition, audit committee, ownership of institutional investors, financial ratios from annual reports and audited financial statements of companies which are listed on the Hochiminh stock exchange (HOSE) and the Hanoi stock exchange (HNX) for the period from 2011 to 2014. However, because of different capital structures and operation requirements, companies such as banks, other financial institutions and insurance institutions were not included, and 229 other companies were also excluded due to difficulties in collecting the relevant data. As a consequence, a sample of 359 Vietnamese listed companies was collected. According to Slovin’s formula sampling techniques with 5% error, the study was then taken of 187 listed firms with the total of 748 observations. A panel data regression method was used in this study. After diagnostic tests, it was found that the Random Effects Model supported the data in the case of ROA as the dependent variable. The Fixed Effects Model also supported the data in the case of Tobin’s Q as the dependent variable. Table 2 shows that the average Tobin’s Q of 0.95 with a standard deviation of 0.312. ROA has a wide range from a minimum value of -65.7% to a maximum value of 58.8% with a mean of 5.5%. The average board has 5.52 directors and has a wide range from 3 to 11 directors. However, the number of women on boards is quite low with an average value of 0.83 directors. The mean value for the independent audit committee members is 3.06 with a standard deviation of 0.517. In general, the ownership of government and the ownership of domestic institutional investors have mean values of 23.78% and 19.28% respectively, and this is significantly higher than the ownership of foreign institutional investors and the ownership of managers, namely 3.12% and 7.54%. Table 3 shows the correlation among independent variables and control variables. It is noted that there is no significant relation among independent variables and control variables. The variables with the highest correlation are Dual and Level (P = -0.70). Therefore, all the variables will be used for regression. The results of the relation between corporate governance and firm performance measured by ROA are presented in Table 4. Similar to the result from REM for ROA, FEM for Tobin’s Q also found there is a significant negative effect of CEO duality, board size and female board members on Tobin’s Q with β-coefficient of -0.0063, -0.0115,-0.0065 respectively, and p-value are almost zero at 95% confidence limit. In addition, the result also reveals a significant positive impact of independent audit committee members, ownership of governance, ownership of foreign institutional investors, and ownership of domestic institutional investors on Tobin’s Q with p-value < 5%. Nevertheless, ownership of managers doesn’t exhibit any impact on Tobin’s Q. Regarding control variables, leverage and inflation show a negative and significant effect on Tobin’s Q, while there is no significant impact of firm size on Tobin’s Q. In summary, the coefficients on CEO duality are negatively and statistically significant for two firm performance measures (ROA and Tobin’s Q). Hence Hypothesis 1 is rejected. Similarly, the coefficients on female board members are also negatively and statistically significant for two firm performance measures. As a result, Hyphothesis 3 is rejected. Apart from that, there is also a significant negative impact of board size on firm performance in both cases of ROA and Tobin’s Q. Therefore, Hypothesis 2 is supported. By contrast, the results suggest that independent audit committee members, ownership of government, ownership of foreign institutional investors, and ownership of domestic institutional investors have a statistically significant positive influence on both the two dependent variables (ROA and Tobin’s Q). 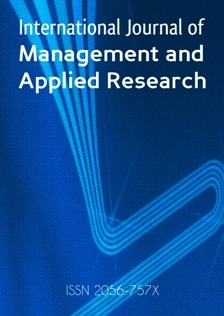 However, the coefficient on ownership of managers is only positively and statistically significant for firm performance measured by ROA, while it doesn’t show any impact on firm performance measured by Tobin’s Q. Consequently, Hypotheses 4, 5a, 5b, 5c are accepted in both cases of ROA and Tobin’s Q. Hypothesis 5d is only accepted in the case of ROA as the dependent variable and rejected in the case of Tobin’s Q as the dependent variable. The research paper was conducted to examine the effect of corporate governance on firm performance measuring factors such as ROA and Tobin’s Q. With the major focus on Vietnamese economy, the data was collected from firms listed in HOSE and HNX, Vietnam. The main findings of this study suggest that CEO duality, board size, and women on board negatively affect firm performance. Conversely, the presence of independent audit committee members is positively related to firm performance. In addition, most ownership of institutional investor is associated with firm performance improvement. Only in the case of Tobin’s Q as a measure of firm performance, there is no evidence relationship between manager’s ownership and firm performance. As a consequence, the study supports the agency theory which confirms that the firm with split titles of CEO and chairman of the board will improve its performance. Regarding board size, the study provides empirical evidence consistent with the arguments of scholars who argue that small board size brings greater focus, participation, and offers fewer opportunities for free riding (Pham et al., 2011), and as a result, small board size leads to high performance. In addition, the study result shows that the presence of female board members will lead to a declining firm performance. By contrast, the presence of independent audit committee members will lead to the improvement of firm performance. Furthermore, the result of the study confirms that ownership of institutional investors is positively associated with firm performance. However, ownership of institutional investors, categorised as ownership of managers, has different effects on firm performance in different measures. The findings presented in this research are limited by few elements of corporate governance being considered and the data being collected over a short time period. Hence, it is suggested that future study should be conducted with more elements of corporate governance and data being collected over longer time period. Cheng, S. (2008),“Board size and the variability of corporate performance”, Journal of Financial Economics, Vol. 87, No. 1, pp. 157-176. https://doi.org/10.1016/j.jfineco.2006.10.006. Jurkus, A.F., Park, J.C., and Woodard L.S, (2011), “Women in top management and agency costs”, Journal of Business Research, Vol.64, No.2, pp.180-186. https://doi.org/10.1016/j.jbusres.2009.12.010. Klapper, L. and Love, I. (2004), “Corporate governance, investor protection, and performance in emerging markets”, Journal of Corporate Finance, Vol. 10, No. 5, pp. 703-728. https://doi.org/10.1016/S0929-1199(03)00046-4. Pham, T.K.T., (2016), “The relationship between corporate governance and the performance of the firm: a literature review with a focus on the Vietnamese enterprises”, Proceedings of the 4th International Conference on Management, Leadership and Governance (ICMLG) , Saint-Petersburg State University of Economics, Russia, 14-15 April 2016, pp.460-465.